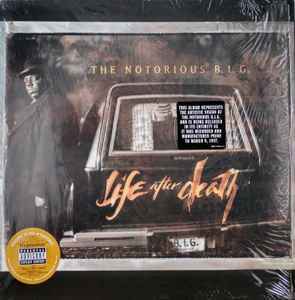 Producer – Deric "D-Dot" Angelettie, Notorious B.I.G. Manufactured & Printed in U.S.A.
All interludes produced for Bad Boy Entertainment, Inc. Released with a graphic insert sheet of the tracklist, additional credits, thank you's, and related information. Anyone else have a copy of this LP with a Promo Gold Stamp label on the back? Good album. Biggie was perhaps the best rapper in the hip hop industry besides Nas who is just the best. Rest in peace, Notorious BIG. My personal favorite Notorious B.I.G. album. Ready To Die is usually hallmarked as a classic of the East Coast Renaissance era, but his second effort definitely shows progression and maturity in regards to subject matter, lyricism, as well as beat selection. A 2XCD album released shortly after his death Life After Death, to me, will always be his crowning achievement.